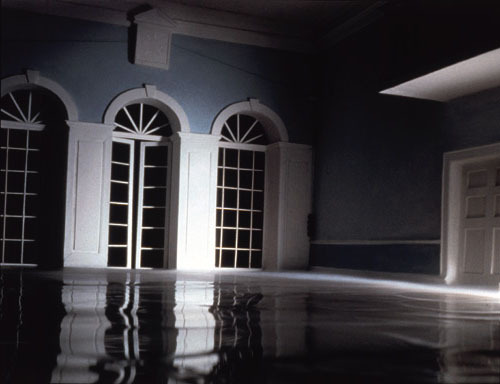 James Casebere, Monticello #3, 2001, Digital chromogenic print, 48 x 60″. Courtesy Sean Kelly Gallery, N.Y.
James Casebere’s photographs evoke our deepest fears and longings. He builds tabletop models that mimic the appearance of archetypal institutions (home, school, library, prison), or archetypal architectural tropes (tunnel, corridor, archway). In Casebere’s photographs, these miniatures often appear to be actual structures. Their serial narratives bear a particularly European, existential angst in spite of the artist’s affinity for American subjects such as the Western frontier and Jefferson’s Monticello. And while his influences seem far flung, from French New Wave cinema to conceptual American art and the early 20th-century Bauhaus and Constructivists, his work feels organically unified. Perhaps this is because his images captivate our collective imagination, the one ruled by instinct. This entry was posted in Criticism, Photography and tagged James Casebere by Matt Niebuhr - West Branch Studio. Bookmark the permalink.